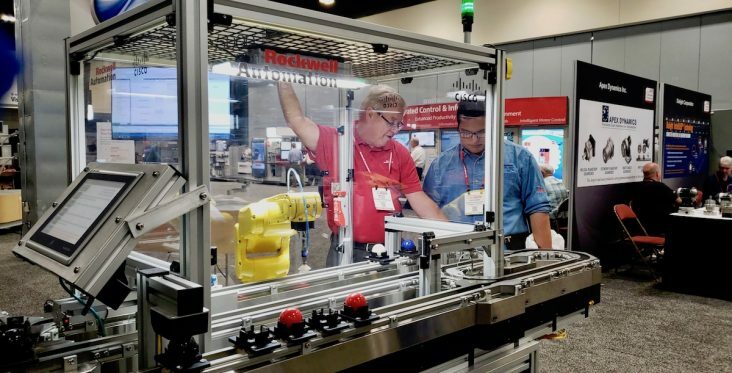 A Rockwell Automation employee displays one of the company’s robotic control systems that can be used in the manufacturing process. Machine tool orders in November fell slightly on a monthly basis while still posting a gain compared with a year earlier, based on a report from the Association for Manufacturing Technology. Orders totaled $458.48 million in November, down 1.7% from an adjusted $466.32 million in October, McLean, Va.-based AMT said in its monthly report. The November figure was 7.1% more than the year-earlier figure of $427.93 million. AMT members “are confident growth will continue,” Douglas Woods, AMT’s president, said in a statement. Among the factors contributing to continued order increases, he said are the aerospace industry reducing order backlogs, increased demand for medical equipment and investment by the auto industry. For the first 11 months, orders totaled $5.01 billion, a 22% increase from the same period in 2017. The highlight occurred in August through October, when orders totaled $1.6 billion, the highest level since February through April 1998. The figures are based on information from companies participating in AMT’s U.S. Manufacturing Technology Orders (USMTO) program. Pat McGibbon, AMT’s chief knowledge officer, said the organization expects full-year 2018 results to show an improvement of between 19% and 21% compared with the year before.